Vacuum Pumps, pressure pumps, cover a wide range of operating pressures. 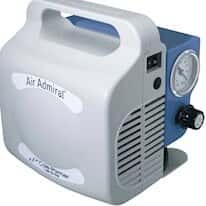 Laboratory/filtration vacuum pumps are for use in the lab or anywhere a low vacuum is needed; typically offer both vacuum and pressure capabilities. Use rough vacuum pumps (or roughing pumps) for laboratory and industrial applications requiring a level of vacuum less than 10–3 Torr. Use high vacuum pressure pumps when you need vacuums higher than 10–3 Torr. Also, consider the free-air capacity needed (the higher the free air capacity, the faster it will evacuate the chamber) and whether you need a lubricated (oiled) or non-lubricated (dry or oilless) pump. Lubricated pumps provide higher capacities, higher vacuum levels, and lower noise, but can contaminate the system and require more maintenance. Select a nonlubricated pump for vacuum in a clean system and low maintenance.